Are you still thinking or looking for a perfect for your love ones or for you this year? Well look no more because LG Mobile brings you a three-day sale of their latest launch mobile devices, the LG G3 Beat and LG L Fino. The Christmas rush sale is from December 19 to 21, 2014. From the original price of LG G3 Beat of P13,990, will be offering it at P9,990and for LG L Fino worth P7,990 will be available for only P6,990. That is a best buy right? The LG G3 Beat comes with a 5.0-inch HD IPS display, a robust 2,540mAh battery, and an 8-megapixel shooter which features Touch & Shoot, Gesture Shot and Front Camera Light. LG L Fino on the other hand has a fast 1.2GHz Quad-Core processor, a 4.5-inch True IPS display, and a 1,900mAh long-lasting battery. Known for its “Designed for Funtography” philosophy, that combines fun with smartphone photography as it gives users quality, blur-free images with premium features built in its 8-megapixel camera. LG Mobile's three-day Christmas rush sale is available at LG Concept Lounge at SM Megamall; LG Concept Stores at SM North EDSA, SM Fairview, Greenhills, Marquee Mall Pampanga, Robinsons Mall Santiago, G Mall, SM Lanang, Lim Ket Kai Mall, Centrio Mall, and Marbel; Abenson Greenbelt; LG Concept Kiosk at SM Cebu, SM Bacolod, and SM GenSan; Aerophone at SM Cebu; Playtelcom at SM Iloilo; and Expression Mobile at Shoppers Mall Zamboanga. 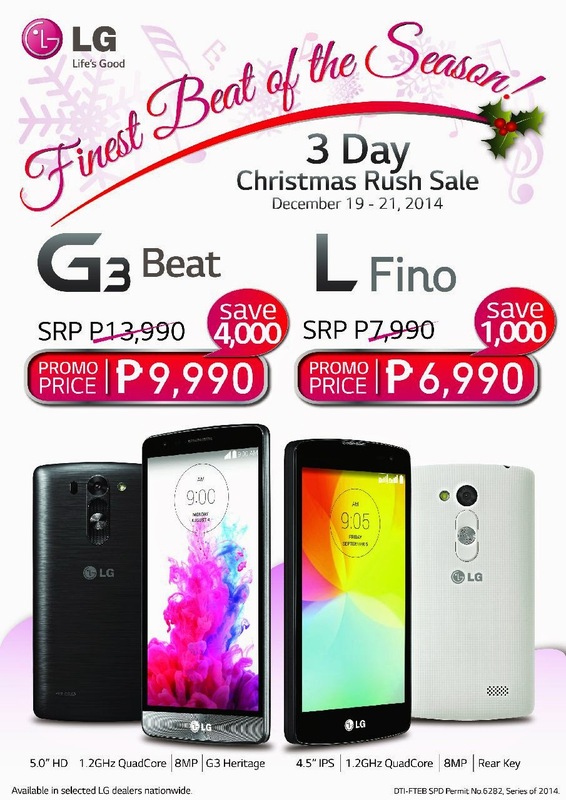 For more details visit http://www.lg.com/ph/inside-lg/3day-christmas-2014-rush-sale. For more information on LG Mobile’s innovative product line, visit www.lg.com/ph, www.lgblog.com.ph, or www.LGnewsroom.com; like LG Mobile’s official Facebook page ‘LG Mobile Philippines’; or follow @LGPhilippines on Twitter and Instagram.